Recorded in the popular spellings of Halton and Holton, this surname is of Olde English and Anglo-Saxon pre 7th century origins. 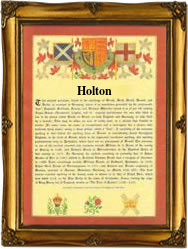 It is a locational surname from any of the various places so called Halton or Holton in Berkshire, Lincolnshire, Lancashire and the West Riding of Yorkshire, to name but a few. Perhaps surprisingly the different villages have several alternative origin translations. The usual meaning is "hall farm", the farm (tun) belonging to the manor house (halh), but other variants include "valley farm" (originally "haugh-tun"), and "rocky farm" (hol-tun), these being from Lancashire and Lincolnshire respectively. The placename and the surname first appears in Norman times, the surname development includes: Richard de Halton of Lincolnshire in1270; Henry Holton, a witness at the London Assizes in 1470; whilst John de Halton, the Bishop of Carlisle in 1305, excommunicated Robert the Bruce, king of Scotland. Other recordings include Peter Halton, who is also recorded as Holton, and who married Agnes Tucker at Orchard Portman, Somerset, on July 19th 1577, and William Holton, christened at East Bower, near Bridgewater, on April 22nd 1697. The first recorded spelling of the family name is shown to be that of Algar de Haltona, which was dated 1086, in the Domesday Book, during the reign of King William 1, known as "The Conqueror", 1066 - 1087. Surnames became necessary when governments introduced personal taxation. In England this was known as Poll Tax. Throughout the centuries, surnames in every country have continued to "develop" often leading to astonishing variants of the original spelling.